The most important aspect of any affiliate program is the incentive. You should offer better incentives than your competitor sites. Money is the biggest and best form of incentive you could offer your customers. Offering a percentage of your sales revenue resulting out of each successful hit can be a great incentive. If you are selling a digitally downloadable information or software product, I suggest offering 50%-75% commission to your affiliates. Since these type of products cost you practically nothing to distribute once created, you want to offer the highest commission possible to motivate your affiliates. Otherwise they will simply find other people's products to promote who pay better than you do. Trust me on this one. I'm a top affiliate for multiple affiliate programs online who have won my loyalty by paying me better than their competition. Apart from the normal incentives, offer something unique such as cash awards and bonuses for the top affiliates who are responsible for bringing in the highest traffic or highest business to your website. This would provide greater motivation for affiliates to not only join your affiliate program but also refer your website to more people. In fact, one affiliate program that I was not a member of started publicizing a contest where the person who referred the most new members by a certain date would win a $10,000 cash prize. Because of the excitement from that company's membership, word got out and I decided to join the company's affiliate program myself so I could take a shot at the prize. A few weeks later, I had referred over 600 new paid members to the company through my online marketing efforts and won the coveted $10,000 prize. Today, I continue to actively promote that company (Empowerism) and bring them hundreds of new members every month through my Plug-In Profit Site service. That's the power of offering a prize/reward to your top affiliates! Standard affiliate programs only reward the direct affiliate for referring new customers. To stand out from the crowd, set up a two-tier or multi-tier affiliate program. In other words, reward both the affiliate responsible for bringing customers to your website as well as the person who had originally referred this affiliate. Allow me to illustrate this strategy. 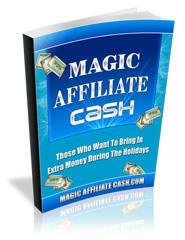 Let's say that John referred Max to your website and your affiliate program. Max liked your affiliate program and joined it and eventually bought your product or service offered on your website. In this case, John would get a percentage of the profit. Now let's say, Max referred your website to a friend of his - Harry. Harry visits your website - likes your product - and buys it. A single tier incentive program would reward Max by giving him a percentage of the profit generated. A two-tier incentive program would offer Max a percentage of the profit, as well as John a percentage of the profit, because John referred Max in the first place. Multi-tier affiliate programs can be very profitable. The above point can be explained in simple terms as "Make it as easy and as natural for affiliates to promote your product or service as possible, by letting your affiliates benefit from those whom they refer". This will encourage your affiliates to convince more people to visit your website, buy your products and join your affiliate program.